A very special “sum-it”, one must say! 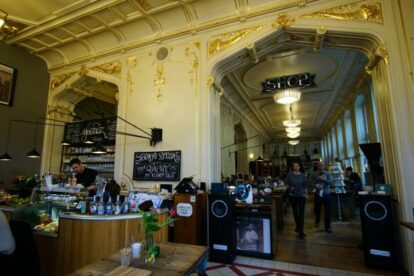 “Sum-it”, because it is the sum of various parts: the café right when you enter, then the attached shop with recording studio at the back end – all of it in the beautiful, influenced by Venetian architecture, building Dogenhof. Come here if you’re looking for a remarkable gift – either for a dear one or for yourself. Are you into analog photography? Then you will be delighted, since this is what they put their heart and soul into – which even led so far as to them flying to Japan, trying to convince Fuji to continue the production of the last existing analog peel-apart instant film. Read the whole story on their page. I want to tell you about one very special thing you can find here: the world’s largest instant photo camera. Grab one of the last chances to get an instant photo (50x60cm!) on one of these by today extremely rare original Polaroid films! No longer produced, their stocks are very limited. If you happen to read this only after you left Vienna, you can order online and they ship it to you. What else? You can record your own single, or book a master session in their recording studio. You can also buy scents in vials which ought to be cracked on special occasions in order to always remember them later on. Read more about their nice concept of a smell memory kit here.